With over sixty five thousand registered sites and counting (as on July 2012), Moodle (Modular Object-Oriented Dynamic Learning Environment) ranks right in the top bracket of Learning Management Services (LMS) on the web. It is free and open, making it a fully customizable system to effectively usher e-Learning or virtual learning to your customers. Moodle is also known as Course Management System or a Virtual Learning Environment. Free, open and customizable - Moodle unzips all its smart benefits at you without any hassles. It is open coded, fully customizable, free of cost and free of licensing issues. Good for starters - If you just thought of taking your coaching or training business to your customer's homes, or offer better training to your employees through e-Learning, then Moodle is a great solution. You can setup the basic website, choose a template, populate your courses and participants and get started. Excellent community support - With hundreds of Moodle support teams and freelancers contributing 24x7, across the globe, you are never far from getting a new feature added, that may make things easier for you. You also get free updates and latest versions periodically. Get expert level customization - If you are seriously looking to load Moodle with all the nicest and personalized features that your business needs then O2I's expert Moodle development team can get that done for you and give you that extra edge. Why select O2I for your Moodle development needs? Moodle experts - Our team has the finest resources on Moodle who have completed many end-to-end and modular projects, right from setting-up to fully customizing Moodle, and bringing the benefits of e-Learning to our clients. We grow with Moodle - Our expert team contributes and keeps track of all the latest news and developments associated with Moodle, e-Learning, and software development in general. This gives us the edge to deliver you the best-in-class services and support on Moodle. Cost and time effective services - As we handle multiple projects on Moodle we can setup and customize on tight schedules; this also makes us deliver services at the lowest possible prices. 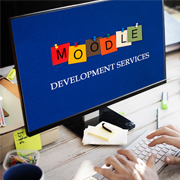 End-to-end and modular services - We offer both end-to-end and modular support on Moodle, so you can call us for even your smallest but important Moodle issue which needs expert attention. Moodle strategy development - We analyze your e-Learning needs and define a strategy to best utilize Moodle and its features. This is the key phase where an expert advice can sometimes change the way you perceive Moodle to address your course management or LMS needs. Our expertise on Moodle will help you design the best learning system for your users. Layout, user management, and pedagogical specifications - Once we define the goals and metrics, our team of experts can give you the optimum site layout and other user management tweaks to give your users that extra touch of excellence that your business offers. Moodle implementation - We keep it simple, smart and effective with optimum focus on achieving set e-Learning goals and standards. This includes basic installation, installing plug-ins, installing additional software and minor customizations. Moodle customization - We can build a highly robust and customized environment for your e-Learning needs. Our developers utilize the features offered by Moodle and develop new capabilities to meet your specific business requirements. Module plug-in development - Our team can develop stable and bug-free plug-ins and modules which are not part of Moodle's support or native community, but highly essential for your e-Learning setup. Moodle template designs - We can give your Moodle the best cosmetic face look as per your brand identity; and also make it richer in user friendliness without compromising on any features. Integration with database and external management systems - We can integrate Moodle to other standard database, CRM, HRM, or management systems to achieve high effectiveness. Moodle migration - We can migrate your existing, local or web-based learning management system to the more effective and easier Moodle system. Moodle testing - We not only guarantee smooth development, customization, and deployment; but we also ensure high reliability and stability through our initial and periodic rigorous testing services. Moodle training - Our training team will deliver all the necessary training support to your team so that they can seamlessly use Moodle to generate greater learning experience for your employees or customers.